Terms of Reference were developed and updated as needed for the PACE Working Group and Project Groups. The objective of the PACE is to increase the environmentally sound management of used and end-of-life computing equipment, taking into account social responsibility the concept of sustainable development, and promoting the sharing of information on life-cycle thinking. 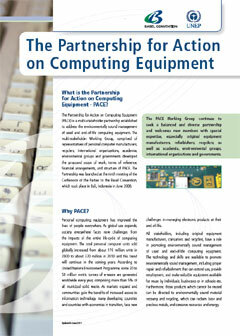 The Partnership covers personal computers (PCs) and associated displays, printers and peripherals. This includes: personal desk top computers, including the central processing unit and all other parts contained in the computer; personal notebook and laptop computer, including the docking station, central processing unit and all other parts contained in the computer; computer displays such as: cathode ray tube, liquid crystal display, plasma; computer keyboard, mouse, and cables; personal computer printer:(a) including the following types of computer printer: (i) dot matrix, (ii) inkjet, (iii) laser, (iv) thermal, and (b) including any computer printer with scanning or facsimile capabilities, or both. The PACE Working Group is the operating mechanism for the Partnership and organizational matters, and serves as a forum for information sharing. The Working Group elaborates its work programme, terms of reference, financial arrangements and establishes Project Groups to fulfill specific tasks. The PACE Working Group continues to seek a balanced and diverse partnership and welcomes new members with special expertise, especially original equipment manufacturers, refurbishers, recyclers, as well as academia, environmental groups, international organizations and governments. PACE Meeting documents and products are posted on the PACE documents website when approved. The work of all Project Groups in ongoing. They initiated a number of tasks to develop their products as described in the Project Group Fact Sheets. The documents developed by the Project Groups are discussed and approved by the Working Group before submission to the OEWG and COP for consideration.